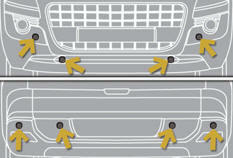 System consisting of four proximity sensors, installed in the front and/or rear bumper. It detects any obstacle (person, vehicle, tree, barrier...) located behind the vehicle, however, it will not be able to detect obstacles located immediately below the bumper. An object, such as a stake, a roadworks cone or any other similar object may be detected at the start of the manoeuvre but may no longer be detected when the vehicle moves nearer to it. - at a speed below 6 mph (10 km/h) in forward gear. This is accompanied by an audible signal and display of the vehicle in the multifunction screen. 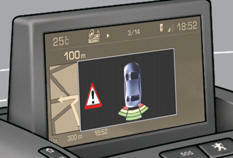 - a graphic in the multifunction screen, with blocks which move closer to the vehicle. The obstacle is located in relation to the emission of the audible signal by the speakers; front or rear and right or left. When the distance between the vehicle and the obstacle is less than approximately thirty centimetres, the audible signal becomes continuous and/or the "Danger" symbol appears, depending on the multifunction screen version. - when the vehicle has been stationary for more than three seconds in forward gear. The parking sensor system cannot, in any circumstances, replace the need for vigilance and responsibility on the part of the driver. Press button A , the warning lamp comes on, the system is fully deactivated. The system will be deactivated automatically when a trailer is being towed or when a bicycle carrier is fitted (vehicle fitted with a towbar or bicycle carrier recommended by PEUGEOT). Press button A again, the warning lamp switches off, the system is reactivated. 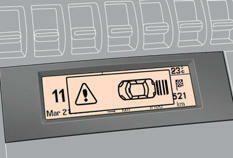 If an operating fault occurs, this warning lamp is displayed in the instrument panel and/or a message appears in the multifunction screen, accompanied by an audible signal (short beep), when reverse gear is engaged. In bad weather or in winter, ensure that the sensors are not covered with mud, ice or snow. 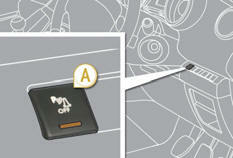 When reverse gear is engaged, an audible signal (long beep) indicates that the sensors may be dirty. When the vehicle is being driven at a speed below approximately 6 mph (10 km/h), certain sources of noise (motorcycles, lorries, pneumatic drills, ...) may trigger the parking sensor audible signals.